Of all the new features in Android 6.0 Marshmallow, an automatic battery-saving function called "Doze" might just be the most interesting. What it all boils down to is that if you set your phone down on a flat surface, the device uses internal sensors to detect that it's motionless and not in use, then responds by drastically scaling back battery-sucking services until the next time you pick your phone up. It's definitely a cool feature and all, and it has greatly improved standby time on every Marshmallow device we've tested so far. But it does take a while to kick in, sometimes requiring as much as an hour of laying flat and motionless before anything happens. Wouldn't it be even better if you could just have Doze take over as soon as you turned your screen off? Oasis Feng, developer of the popular battery-saving app Greenify, thought the same thing. As a result of his work, you can now make Doze kick in as soon as you turn your screen off and lay your phone down—and the best part is, you don't even have to be rooted to do it. The new Greenify feature that enables Doze as soon as you turn your screen off is only available in the beta version of the app. So to begin, head to the following link from your Android device, then tap the "Become a Tester" button. 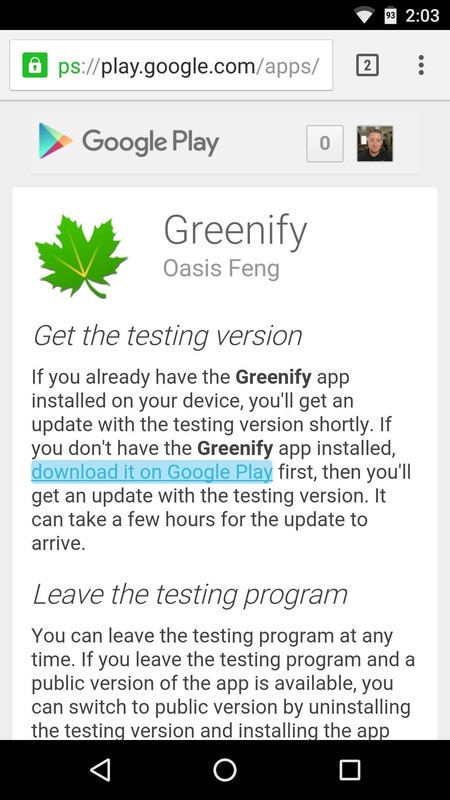 Next, either tap the link on the beta signup page that says "download it on Google Play," or use this link to head to Greenify's download page. 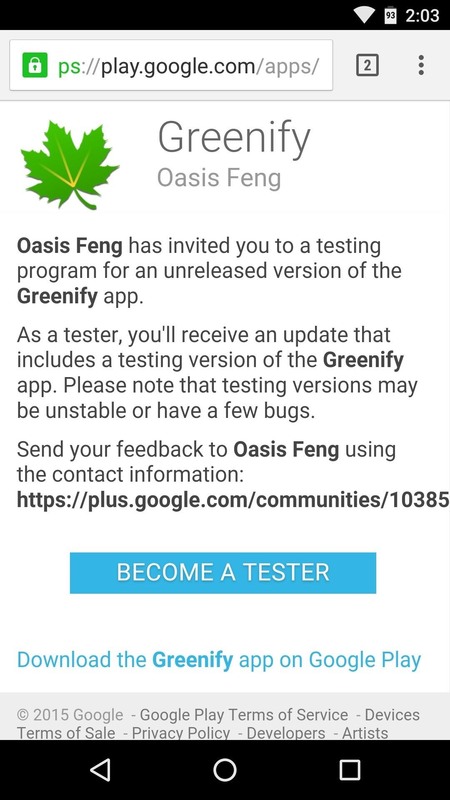 From here, either install the app if you haven't done so already, or update the app if you already have it installed to make sure you're running the latest beta version of Greenify. If your device is rooted, you can skip this step. 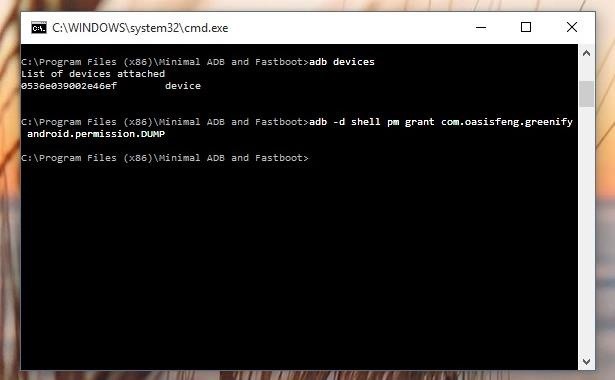 Otherwise, for the non-rooted users, you'll have to execute a one-time command through ADB. For more information and troubleshooting tips on this part of the process, see the developer's guide for enabling Aggressive Doze on non-rooted devices. 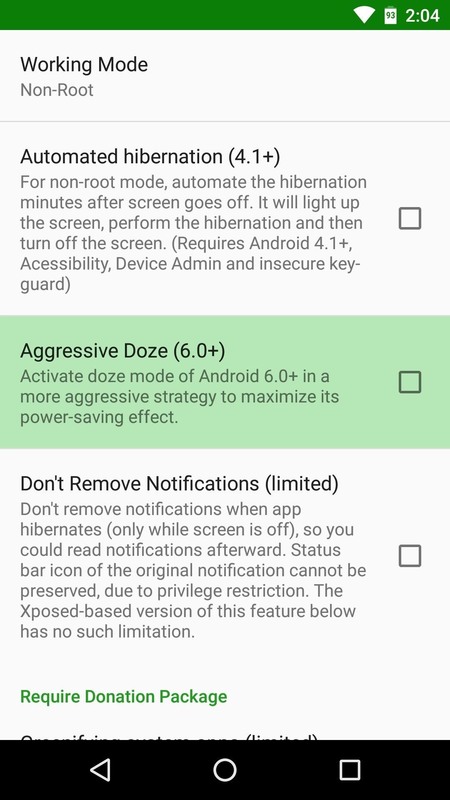 Now you're ready to enable the "Aggressive Doze" feature in Greenify, which will cause your phone to enter battery-saving Doze mode as soon as you turn your screen off. 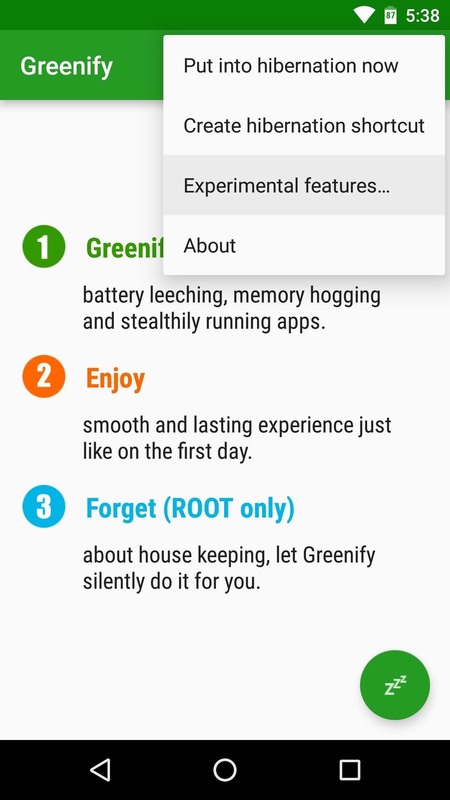 So to wrap things up, tap the three-dot menu button on Greenify's main menu, then select the "Experimental features" option. From here, simply tick the box next to the "Aggressive Doze" option, and you'll be all set. From now on, your phone will enter Doze mode immediately after you turn your screen off and lay your device down on a flat surface. If you'd like to verify this, head to the battery menu in Settings, and any flat lines you see on the graph will indicate the times that your phone was in Doze mode. How much battery life have you saved by enabling Greenify's Aggressive Doze mode? Let us know in the comment section below, or drop us a line on Android Hacks' Facebook or Twitter, or Gadget Hacks' Facebook, Google+, or Twitter. After going through that tutorial, open Terminal on your Mac, connect your phone to your computer with a USB cable, then send the commands listed in Step 2 of this article. it appears as though the Aggresive Doze feature has been removed in the latest version? Are you sure you've got the beta version already? If you tap the 3-dot menu button and go to "About", it should say version 2.8 beta 2. Sometimes, after you sign up for the beta program on Google Play, it can take a few hours for the beta update to show up, so maybe check again for updates. Dallas thanks for this excellent write up. Quick clarification if you will, you mention that doze will begin as soon as the phones screen is turned off (put to sleep?) then later, you mention that doze begins as soon as your screen is off and the phone is flat. I am curious, if the phone is in your pocket flat, yet upright vertically, will it still go into doze? will this only speed up doze if your phone is on a flat surface? I was unimpressed with the strength of the battery to say the least when I got this phone. I will prob be keeping this phone for 2+ years to say the least, and when I read on paper about its 3450mAh battery, I was expecting MUCH more. 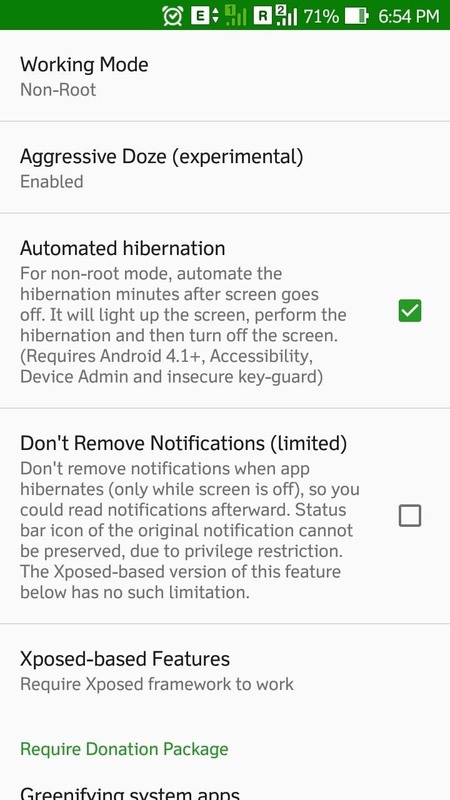 I am hoping that this will set doze mode to begin immediately after the phone's screen is turned off no matter how its placed/situated, can you confirm this? Unfortunately, it still requires that your phone is laying flat and motionless. Basically, it just causes Doze to run its sensor checks as soon as you turn your screen off as opposed to waiting 30 minutes, but everything else remains the same. This can still be greatly beneficial for some folks, but it may not help much depending on how you use your phone. For instance, if you activate Aggressive Doze through Greenify, then leave your phone on a table, it will enter low-power mode almost immediately. But if you keep in in your pocket, Greenify will make Doze run its sensor checks as soon as you turn your screen off, but it will see that you're moving around and decide not to kick in. There's still a lot to learn about how Doze works under the hood since Google didn't provide much documentation, so hopefully someone can figure out a way to bypass the sensor checks eventually. If you uninstall Greenify and reboot, it should take away the extra permissions that were granted by that command. After that, you could reinstall Greenify and everything would be exactly as it was before you ran the command. uninstall greenify or factory reset your phone..
You should have mentioned that the android.permission.DUMP permission gives Greenify access to very sensitive device information. The app also has full network access (not that it would be safe even if it didn't).